This posting will remain at the top of my page until further notice. It has been six years since that fateful morning. Dawn rose over the New York metro area and it was a gloriously bright and sunny morning. The sky was blue without a cloud in the sky. Lower Manhattan's skyline was dominated by the World Trade Center's Twin Towers. They were gleaming in the sun. The news from around the day was the usual mix. Shortly before 9:00 AM, everything changed. First one plane hit one of the towers. Then a second plane struck the other tower. The sky across Lower Manhattan was already full of smoke that belched from the Towers along with the sight of people falling and jumping from the World Trade Center. Papers from offices within the towers were flung into the sky and debris was falling all over the place. Firefighters and police officers from all over the City instinctively headed to the Towers, knowing that they would be called upon to help rescue those in harm's way. Both towers, hit by airplanes going at full speed, were aflame and no one knew how many were trapped in the buildings. We feared the worst, and even then, it couldn't prepare us for what came next. First one tower collapsed. Then the other. In the minutes after the collapses, one could barely comprehend what was just witnessed. One moment, the towers were there. The next - they, and everyone within, were gone. 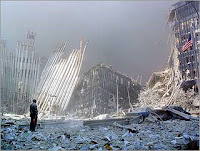 The Towers could each hold tens of thousands of people, and no one knew for sure just how many had managed to escape. In the hours and days following the collapses, we feared that the toll could be over 10,000, and then with a sigh of relief saw that the toll shrank to under 3,000. It was still more than we could bear. While the crisis was unfolding in Manhattan, we would hear on the radio and watch on television of other hijacked planes. 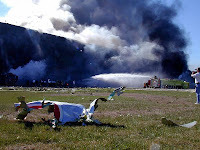 In total, four planes were hijacked - the two that hit the Towers, one that would hit the Pentagon, and one that would crash in Shanksville, PA. In total, more than 3,000 people were killed by Islamic terrorists who hijacked four airplanes, destroyed the entire WTC complex, damaged the Pentagon, left a brutal scar in Shanksville, PA, and inflicted billions of dollars in damage on the US and local economies. It was a black day. It was also a day of great heroism and supreme sacrifice. The scars are still present to this day. The memories of that grim day remain with those who saw and smelled and felt it in person and the millions who witnessed the events on television or heard them unfold on radio. Lower Manhattan still has an empty skyline. The global war against the terrorists continues - with some successes and some failures. There are days when one can see hope and other days when you have to wonder whether we have the fortitude and persistence to fight and win. Last year, I wrote of the ongoing problems in building in and around Lower Manhattan. After 241 entries in my Battle for Ground Zero series, I finally felt that I could retire that series and begin writing about the rebuilding. Steel for skyscrapers is going up at Ground Zero. Where there was only the intermittent sound of PATH trains running through Ground Zero in past years, there are now the sounds of construction crews bringing in loads of concrete or steel for use in the transit center, museum/memorial, and the Freedom Tower. The real estate market in Lower Manhattan has grown as other companies flock to Lower Manhattan. Goldman Sachs is busy building a new building across from Ground Zero, and other companies, including Larry Silverstein, are putting up new buildings. The lower levels of the Freedom Tower are taking shape as the foundations and sub levels are being formed. The cranes that will lift the tower into position are in place. Architecture critics continued to take potshots at the Freedom Tower, though they have been more approving of the other towers that will be built at Ground Zero by some of the most famous architects in the world, including designs by Sir Norman Foster, Richard Rodgers, and Fumihiko Maki. The Eastern Side of Ground Zero will be remade into a row of gleaming glass towers, each distinctive as landmarks in their own right. Engineers and architects are still learning the lessons of the 9/11 attacks, and are working to build better and safer skyscrapers and structures. One of the first built after 9/11 in Manhattan, 7WTC, includes wider emergency staircases that are spaced further apart and are reinforced to protect them from damage such as those within the Twin Towers suffered. Nova's program will air on September 11. That isn't to say that all is well at Ground Zero. There are strong financial and real estate interests who don't want to see new towers built that would eclipse their buildings in Midtown with amenities and competitive prices. The costs for construction threaten the grand designs of those designing the structures at Ground Zero. Calatrava's signature transit hub, which was estimated to cost $2.2 billion may again be revised to accommodate price increases on steel and other construction materials. Estimates now suggest the final price tag may be $500 million to $1 billion higher because of the higher cost of materials. The increased costs are due to high demand for steel around the world, and in the New York metro area in particular as major projects abound. Then, there is the star crossed Deutsche Bank building to deal with. That building continues to inflict pain and misery. Two firefighters were killed in a seven-alarm fire because of multiple failures - by the FDNY to inspect the building or follow its fire plans, careless smokers, and possible negligence by the companies involved in the deconstruction of the building that was badly contaminated by the collapsing Twin Towers and exposure to the elements. Criminal investigations are underway and three fire officers have been reassigned to desk duty for their acts and omissions. Just days later, two more firefighters were badly injured when a pallet jack fell from the upper floors and crashed into a shed at the base of the building. The Deutsche Bank building is in the background of that last photo, and you can see the scaffolding and plywood forms on the upper floors. Deconstruction of the building must proceed in order for construction of the other towers to proceed, which threatens the tight schedules for construction throughout Ground Zero. Workers at Ground Zero continue to be dogged by medical ailments, and reports continue to come in about how firefighters and others who worked on the Pile have suffered from respiratory ailments. Asthma rates are higher among Ground Zero workers who worked on the Pile (especially in the early days of the relief and recovery efforts) than the general population. A new survey of Sept. 11-related illnesses has found an alarming increase in asthma _ 12 times higher than normal _ among those who toiled on the toxic debris piles of ground zero. The data show 3.6 percent of the 25,000 rescue and recovery workers in the registry reported developing asthma after working at the site _ more than 12 times the expected figure for adults over a similar time period. We must do all we can to avoid treating them as the American version of the Chernobyl liquidators. Indeed, the Village Voice reports that there are some 52 ailments that have been connected with 9/11, the collapses, and the subsequent fires and cleanup/recovery efforts. There are also questions over the Irving J. Selikoff Center for Occupational and Environmental Medicine at Mount Sinai Medical Center that has provided medical care for thousands of workers. In particular, there are questions over data collection that could yield critical information as to causes of ailments or prevalence and claims that it may have yielded to union pressures to find linkages. Politics trumping science. Yet, claiming that you'll get better care in Cuba than in the US does no one any good, and those workers who went along with Michael Moore's medical tourism to Havana, should have known better. Politics trumping science - yet again. Lest we forget, the death toll from 9/11/2001 continues to rise. And it keeps rising: two more cops who worked at Ground Zero died of ailments linked to the WTC collapse last week, according to their families. One has to wonder whether those who have died since the attacks will have a place of honor in the memorial for their injuries and illnesses sustained in the attacks and the aftermath. Construction of the memorial in New York City is finally underway, and fundraising has gotten a boost since Mayor Bloomberg took the helm of the project. The memorial will also include two of the distinctive steel tridents that formed the exterior base of the Twin Towers. The massive steel tridents, standing up to nine stories tall, have been chosen as the iconic symbols that will be seen by millions of visitors expected to arrive at the World Trade Center Memorial after it opens in late 2009. Since the early days of planning for the memorial, designers had been urged to include an iconic artifact as part of the public plaza at the memorial, said Alice Greenwald, director of the World Trade Center Museum. The New York Historical Society is putting the finishing touches on a 9/11 exhibition, which will feature hundreds of artifacts, including parts from the planes that were purposefully crashed into the Twin Towers. The exhibition in the society, at West 77th Street and Central Park West, is another in its History Responds series of shows, programs and screenings related to 9/11. More than 150,000 visitors have attended 16 previous exhibitions there exploring aspects of the terrorist attacks. Nine of the 10 objects in the show are in the society’s collection (the landing gear is on loan from the New York State Museum in Albany), and all have been displayed at the society before, though never so carefully and never with the photography collection. Things aren't going quite so well for the Flight 93 Memorial in Shanksville either. Questions continue to swirl over the appropriateness of the use of a crescent in the memorial and its orientation on the site that evokes the Muslim symbol. This year, the families of victims will still be able to walk down into the Pit at Ground Zero to pay their respects, even though Mayor Bloomberg first stated that such a move would be impossible because of construction. This caused quite a kerfuffle, but it was resolved for this year. Next year - such a visit to bedrock will be impossible because construction at the site will make it impossible. Those families will have to realize that such memorialization at Ground Zero will be impossible until the Memorial is finally built, which is still several years away from completion. The New York Times also notes tribute fatigue - that there are some people who think that the time to grieve at Ground Zero has past. Then, there's the whole issue of conspiracy theories. Loons and nutcases have been claiming that there was a conspiracy on 9/11 by shadowy government forces that blew up the towers - that the planes alone did not destroy the WTC, that explosives brought down 7WTC, and other similar fanciful theories. Screw Loose Change has been chronicling the Troother movement, which claims that the 9/11 Commission whitewashed the facts and how and why the towers collapsed. All these conspiracy theories do is hurt the families of those who lost loved ones on 9/11 and thereafter - they're poor attempts at trying to come to grips with the incontrovertible fact that Islamic terrorists have wanted to destroy the WTC since 1993, and succeeded on the morning of 9/11 by hijacking aircraft and crashing them into the Twin Towers. 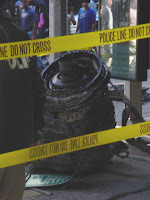 The damage from the airplane impacts caused fatal damage to the towers. The collapse of 7WTC is especially ripe for conspiracy theories because it collapsed hours after the Twin Towers were felled by the planes. The attack on the Pentagon is claimed to have been nothing more than an unmanned vehicle or car bomb, despite clear evidence that a jet plane was purposefully crashed into the building. And the number and type of conspiracy theories continues to multiply and get even more bizarre with each passing day. It's especially worrisome when you get big media outlets, actors and actresses, and members of Congress pushing these insanities - they get pushed closer into the mainstream, despite the utter lack of evidence to support them. Those Members of Congress are catering to the fringe, all in the name of politics, and they're pushing facts and logic out of the way - demagoguery in a most overt form. Carl in Jerusalem, meanwhile, notes the solemnity that went along with remembering those lost in the attacks on the sixth anniversary according to the Jewish calendar - the 23rd of Elul, which actually occurred on September 6, 2007. It is one of the most moving stories I've read of that day and the aftermath. And the fate envisioned by The Onion for the Islamic terrorists responsible for the terrorist attacks and ensuing carnage is still not enough. Gothamist has more on the downtown revival that has remade Lower Manhattan since the 9/11 attacks. There are now more residential developments to go along with the surge in commercial properties going up. That doesn't include work at Ground Zero proper. Also, Channel 7 has changed its mind on broadcasting the memorialization of names at Ground Zero tomorrow. See here. I've corrected text above. The issue of memorialization and when to stop with the public reading of names is a very tricky and sensitive one. The public reading is a very vivid and tangible reminder of what happened on 9/11/2001. At some point, I expect that people will no longer read the names in public and life will get back to "normal." I don't know if that's right or wrong - everyone grieves in their own way and it is not up to me to say how someone should or should not remember lost loved ones. The City of New York has opened a new website to host 9/11 related health issues as a one-stop guide. Welcome to 9/11 Health, a public information web site developed by the New York City Department of Health and Mental Hygiene (DOHMH). This site provides the latest information about scientific research and services for people who may have health problems related to the September 11, 2001 terrorist attack on the World Trade Center. Spanish, Chinese and Polish language translations of the material found here are now underway and will be posted in the near future. DOHMH welcomes visitor feedback and plans to provide additional enhancements to this web site over time. Michelle Malkin has a moving tribute and includes video and other photos. Lorie at Wizbang has a huge post of links and references to others who have marked the passing of time. Six Meat Buffet has gone dark today to honor those who died. My friend and coblogger Legalbgl wrote this last year in remembrance of Donna Bernaerts-Kearns as part of the 2,996 tribute. Jammie takes a look at what DKos has posted. Rudy's campaign website has gone dark for 9/11. Thanks to Gothamist, Hot Air, song and dance man, legalbgl and zombie for links and photos. Photos taken by lawhawk are noted where appropriate.